Looking for high-performance paints to enhance your home? Look no further than Specialist Paints Online. With a Specialist Paints Online voucher, you can enjoy great savings on a wide range of durable, quality paints for floors, walls, ceilings and more. So whether you want a practical non-slip layer for the kitchen floor or special property protection paint to keep your home secure, Specialist Paints Online vouchers will save you money while you shop. Specialist Paints Online is an experienced and professional paints supplier, offering customers a wide range of specialist paints for all their decoration needs. Committed to producing high quality, long lasting paints sold at a reasonable price, Specialist Paints Online is ideal for anyone whether they're just indulging in a spot of DIY or renovating their whole home. Specialist Paints Online stocks an extensive range of paints, effects and finishes for a variety of specialised applications, including durable floor paint, anti-slip paint, garage door paint and more. They even stock a selection of enamels for vehicle maintenance – whatever you need, they'll find the right product to suit your needs. Want to make your home or workplace more secure? At Specialist Paints Online you can choose from a selection of paints designed with property protection in mind. From anti-graffiti coatings to anti-climb paints, these products act as a superb deterrent to potential vandals and help to keep your property safe. Or perhaps you're looking for preparatory treatments to ensure even and long lasting coverage? Choose from stain blocking primers, oil removers, etching primers and more. At Specialist Paints Online, they understand that you can't always find the specialist paints you need in your local DIY store, and that you sometimes require a little specialist help and assistance to choose the right product for you. That's why they maintain an extensive database of how-to guides on their website, as well as a dedicated customer service team that's always on hand to point you in the right direction. You'll find the very best paints on offer at fantastic prices, along with a great range of painting and DIY accessories such as brushes and rollers, non-toxic pet-friendly paints, sports line markers and much more. And once you've chosen the products that are right for you, you can take advantage of Specialist Paints Online's fast and efficient delivery service and have your order delivered right to your door. 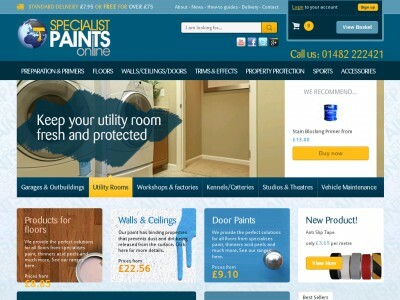 Want to get shopping with Specialist Paints Online? With a Specialist Paints Online voucher you can enjoy great deals on a wide range of paints and primers for every service. Whether you want a new coat of paint for your garage door or a non-slip coating for your floor, Specialist Paints Online voucher codes will save you money while you shop. Browse our website until you find a Specialist Paints Online voucher that suits you, then navigate to their website to begin shopping. Enter your personal information and click 'Submit details'. Enter your Specialist Paints Online discount codes where applicable. If you've enjoyed shopping for high-performance DIY supplies with Specialist Paints Online, you might like to see more great deals on essentials for updating your home at stores like B&Q and Made. Of, if those aren't right for you, you'll find plenty more to browse in our Home and Garden section. Enter your Specialist Paints Online voucher where applicable. Standard UK delivery is free on all orders over £75. For orders under £75, delivery is charged at £7.95. Need to contact the team at Specialist Paints Online? Whether you have a question about your order, want expert advice on which products are right for you or simply want to find out more about how you could make big savings with Specialist Paints Online vouchers, you can contact the Customer Services department by telephoning 01482 222421. Want to find out more about what's happening behind the scenes at Specialist Paints Online? Why not follow the company across your favourite social media networks? You'll find lots of great content such as industry news, home décor tips, promotions and more. You can also use these pages to find out more about saving money with a Specialist Paints Online vouchers. Don’t forget to check them regularly, as you can never be sure when free Specialist Paints Online voucher codes might be waiting for you! Buy now online at www.specialistpaintsonline.co.uk. We wanted a quality, non-slip floor for our family kitchen – but we didn't have a fortune to spend. Luckily, we found a Specialist Paints Online voucher on the web. With Specialist Paints Online vouchers you can get great deals on a wide range of special application paints and primers at specialistpaintsonline.co.uk. We used our Specialist Paints Online discount code to make big savings on special floor paint to match our colour scheme. Now we have a great family kitchen without spending a fortune thanks to Specialist Paints Online vouchers.